The medieval origins of Nefyn as an urban settlement derive from its coastal location, availability of good agricultural land and the choice of native Welsh princes as their commotal centre and subsequent commercial borough. Though surviving medieval remains are confined to the churchyard and motte, much of the present maze of paths and streets, one of the defining characteristics of the town, also owes its origin to the medieval and sub-medieval borough. The varied topography results in short views along many of the thoroughfares, and the casual visitor is led on, determined to see what is round the next corner. Even Well Street, which preserves the line of the medieval borough, is relatively short, with clearly defined curving ends. The best examples are by the church, where Stryd y Felin, Stryd y Llan and Stryd y Mynach are interlinked by subsidiary paths. After 1400 the heyday of Nefyn as a commercial borough was largely over, but it continued as a market town with strong agricultural and fishing links and a small ship building industry. The town was particularly well known for its herring fishing, and from medieval times to the early 20th century a large proportion of the population would have been involved with fishing. Nefyn continued to operate as a small market town into the 20th century, though shops have declined in recent years. There are no known pre-18th century buildings, and by far the majority of the buildings within the old town are 19th century. Significant buildings which remain in the old part of the town include St Mary’s church and the buildings to the north, particularly the Old Bull Inn. Y Felin, the mill, survives to the north, though cannot be seen from Stryd y Felin. At the lower end of Well Street lie Tir Receiver with the houses of Minffordd and Newborough alongside, and south again, Nanhoron House. Minffordd and Newborough are two of the best surviving examples of the vernacular Georgian town house, whilst Tir Receiver is of earlier origin and end on to the street. At the south end of the street the well is the focal point, the present stone well house dating from 1868. There are several examples of stone buildings at this end of the street, including the tall 3-storey terrace below the Three Herrings, built of regularly coursed dark stone blocks, which have been unfortunately ribbon pointed and the windows modernised, as also have the windows in the 18th century inn. Nonetheless the scale of these buildings is a reminder that this is the town centre, and the buildings grouped about the cross-roads included two substantial inns, two banks and several shops and cafes. 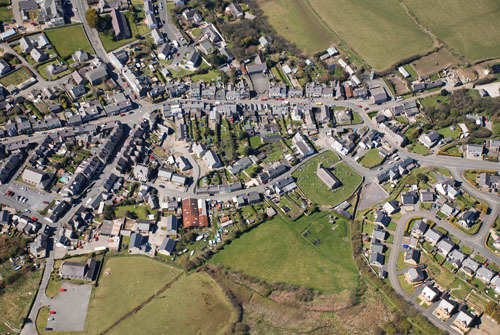 Y Maes is defined by tightly packed houses in groups, with more open areas recalling its former use. The resulting effect is complex and busy, with buildings at contrasting angles which reflect the historical boundaries underpinning subsequent development. Expansion of the town past St David’s and towards Morfa Nefyn is an interesting example of early 20th century development of largely civic functions, including the school, church, church hall and war memorial. The wider roads and more open nature of the development contrasts with the older town.